A majority of Americans are opposed to building a wall along the southern border, but are in support of giving “Dreamers” citizenship, according to a new Gallup poll. While 57% disapprove of building a wall across the US-Mexico border, 83% support granting allowing of DACA immigrants to be citizens. The poll didn’t ask about President Donald Trump’s controversial “zero tolerance” policy, which was separating families at the US-Mexico border until he signed an executive order on Wednesday. A majority of Americans are opposed to building a wall along the southern border, but support a deal for the “Dreamers“, according to a new Gallup poll. President Donald Trump made building a border wall a hallmark of his presidential campaign, and has continuously pushed Congress to give him funding to build it since taking office. The Deferred Action for Childhood Arrivals program has shielded hundreds of thousands of young, unauthorised immigrants from deportation since 2012. While 57% of Americans disapprove of building a wall across the US-Mexico border, 41% of Americans approve of it. Meanwhile, 83% of Americans support allowing Dreamers to become citizens in comparison to only 15% who oppose it. When it comes to programs that allow legal residents to sponsor relatives living abroad to the move to the United States – a practice conservatives disparagingly call “chain migration” – 52% of Americans don’t want to end these programs while 45% are in favour of getting rid of them. About 50% of Americans favour the policy of banning sanctuary cities, while 46% are opposed to such a measure. Gallup also broke down the questions by party. While Republicans and Democrats differ greatly on the border wall and sanctuary cities, both parties are closely aligned on handling DACA and family-based immigration. 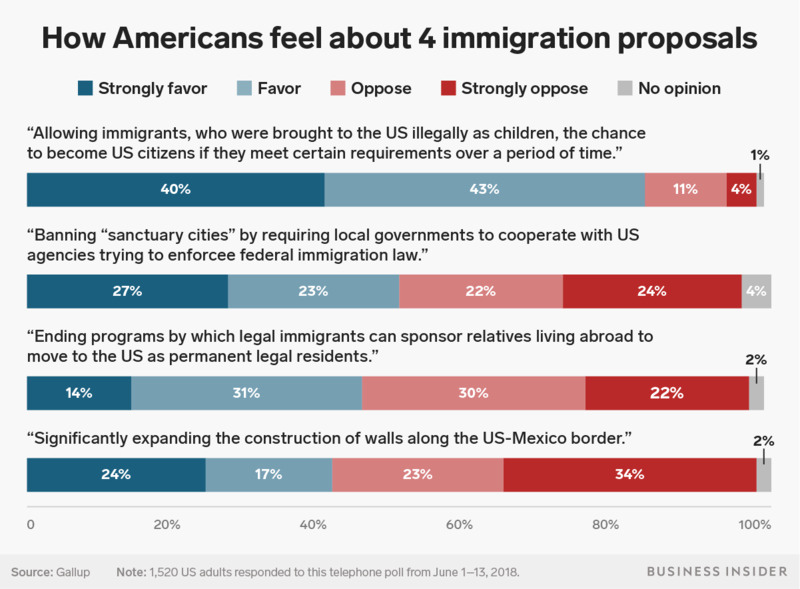 While 77% of Republicans support the banning of sanctuary cities, only 29% of Democrats are in favour of it. Meanwhile, 73% of Republicans are in favour of expanding the border wall in comparison to only 13% of Democrats. Getting a deal done on DACA garners support from 92% of Democrats and 75% of Republicans, while ending family-based immigration earned support from only 47% of Democrats and 43% of Republicans. The release of Gallup’s new poll comes amid the Republicans’ push to pass an immigration bill through Congress this week and, the uproar over Trump’s “zero tolerance” policy that separated migrant families at the border. Trump signed an executive order on Wednesday to end the practice of family separation – instead keeping families detained together. The Gallup poll didn’t ask about the zero-tolerance policy or family separation.